Toasted coconut and a coconut milk glaze top this moist, coconut-filled healthy breakfast bread from the book Sprouted Kitchen. 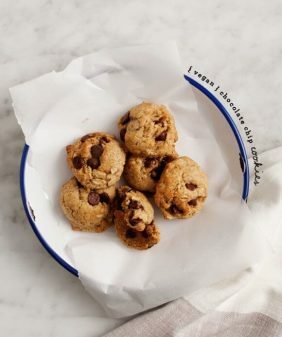 Great for dessert, too! I’ve been reading Sara & Hugh’s blog Sprouted Kitchen for about as long as I’ve been reading 101 Cookbooks. Which is food blog code for: a long time. I’ve had their book pre-ordered for months, but was excited (flattered, really) when Sara sent me one. We are a lot alike… First off, Sara suggests readers should buy and plant a lemon tree. (I’ve been talking about planting a lemon tree for about 2 years now – time to get on it). In another section she talks about being offended when Hugh once referred to her style of cooking as “bowl foods” (because “that’s not a style for heaven’s sake”)… which is just the sort of thing Jack would say, and exactly the way I would react. But what we really have in common is breakfast. I like eggs with piles of greens, and Jack would be one for sweet foods in the morning. I made these coconut loaves yesterday afternoon, which doubled as dessert last night, and tripled as breakfast this morning. Coconut is one of my favorite things, especially coconut oil, because it’s a great sub-in for butter. This loaf is sweet but not too sweet, just the way I like it. You can’t really tell in the photo, but I threw some chopped mango in one, and (well pictured), some chocolate chips in the other. Read below for the recipe, or get the book — more of their beautiful recipes include edamame & scallion dumplings (which I made & loved), soba bowls with tea-poached salmon, and a gorgeous tuscan kale salad that’s on my to-make list. Preheat the oven to 350 F. Grease an 8½ inch loaf pan or 2 mini loaf pans with a bit of coconut oil. 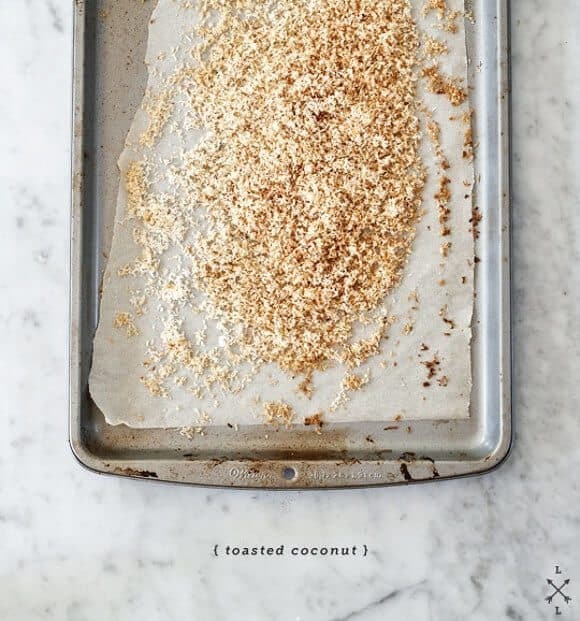 Spread the shredded coconut on a rimmed backing sheet and toast in the oven until just golden brown, about 4 minutes. Watch it carefully, it can burn quickly. Set aside ½ cup for topping the loaf. 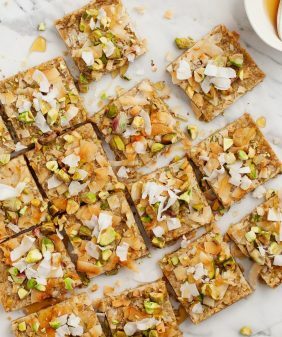 In a large mixing bowl, combine 1½ cups of the toasted coconut and the turbinado sugar. Sift in the flours, nutmeg (or cinnamon as I did), baking powder, baking soda, and salt and stir to combine. In another bowl, whisk the eggs together, then whisk in 1 cup of the coconut milk, coconut oil, and the vanilla. Gently stir the wet mixture in to the dry ingredients until just combined. Pour the mixture into the loaf pan(s) and bake until a toothpick inserted in the middle comes out clean. 45-50 minutes for a full sized loaf pan, about 25-30 minutes for the mini pans. Remove from the oven and let cool to room temperature. While the loaf is cooling, combine ¼ of the remaining coconut milk and the powdered sugar in a bowl and whisk until there are no clumps. Add more sugar or more coconut milk, to taste, depending on the consistency you prefer. (You won’t use the entire can of coconut milk). Pour the glaze over the cooled cake and sprinkle the remaining toasted coconut on top. Serve with blackberries on the side, or seasonal fruit of your choice. This recipe is reproduced with permission. The Sprouted Kitchen, a tastier take on whole foods is published by Ten Speed Press. I agree 100% with the need for a lemon tree! We moved into a house with one in the backyard & now can’t imagine living without it. This coconut bread looks amazing too! Yay! Their cookbook is on my “wish list,” I hope to lay my eyes on it soon. I know you admire their wonderful style, but you’ve got to give yourself credit too. You’ve developed quite a distinct, lovely style. Hope you decide to do a cookbook someday too! I can’t wait to get a copy of Sara’s book, it sounds wonderful and I know this loaf is right up my alley! just received an email that mine shipped today – can’t wait! thank you so much! I LOVE your photos! You my dear have a gorgeous style, and your site is so pleasant to visit. I really admire the work you do. Thanks so much for the kind words, feels so nice to hear. Glad you liked the loaf, can’t wait to try it with mangos! brilliant! Oh, I do love coconut. This looks lovely. Can’t wait to try it! This loaf looks lovely! I can’t wait to get my hands on that book too! 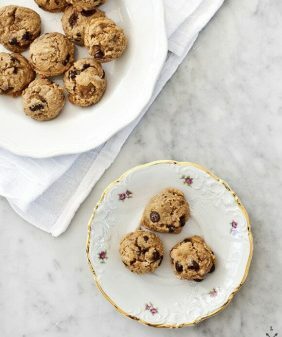 Great review and love the recipe you decided to showcase from the book! These coconut loaves look about the right size to be extremely dangerous. Like, I would sit there and eat the whole load and justify it because it was mini! Would a lemon tree grow in Chicago? Hmmm, probably not. This book is also on my wish list, it seems to be incredible and I’m a real fan of healthy breakfasts too. I’m also wondering if the lemon tree would grow in Switzerland, where I live… will do some research on that ! 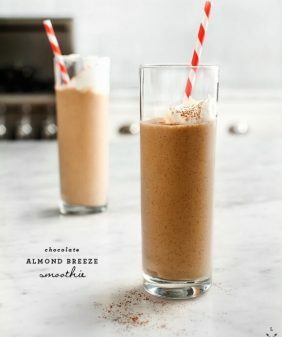 I just adore Sprouted Kitchen, the blog and the book and the people behind it. 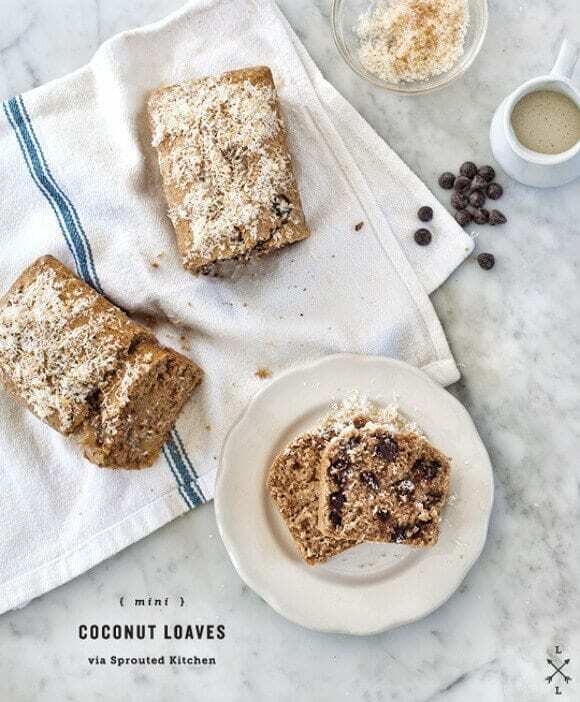 I am definitely making this coconut bread asap! This was the first recipe I made from the book. Loved it! Just found your site via this offer. I have won the lottery! 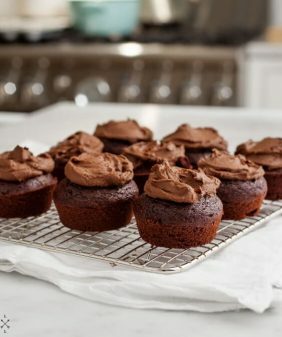 I’ve just pinned several recipes I can’t wait to make. Winning The Sprouted Kitchen, from my other newly found site, would be great. YUM. 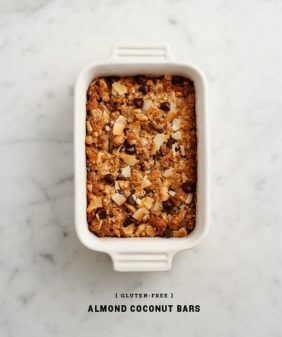 I just made this for dessert with chia seeds instead of eggs and with chocolate chips. SO GOOD!!!!! I’ve made this twice. Both times a big hit with hubby and myself, and even my mom-in-law. But very crumbly! Any ideas as to how I can get it to stay together? through more related to this?